An Extra AC power supply is not necessary. 2-wire loop powered performance allows direct connection to DCS I/O card possible - allowing for real cost reductions. Reduce the CAPEX and OPEX on your site. Power saving : 1 to 4% power consumption of typical 4-wire magnetic flowmeter. Annual CO2 emissions can be reduced from approximately 73kg to 1.4kg (compared to a standard 4-wire magnetic flowmeter). Only YOKOGAWA can provide unique and advanced excitation method. "Dual Frequency Excitation" achieves stable measurement, zero stability and quick response times. The exclusive technology for stable and reliable measurement on your site. Flow noise reduction is further achieved by incorporating smooth mirror finished PFA liners and special surface finished electrodes. This is further enhanced with aligned super high density coils that generate a stronger magnetic field. YOKOGAWA believes safety should not be an option, it should be standard in all modern products. AXR is the first 2-Wire Magmeter of SIL2 Safety Integrity Level (IEC 61508) certified. AXR is capable of SIL2 single use and SIL3 redundant use, as standard. AXR has magnet switches for parameter setting. Users can access the functions without removing the case cover in hazardous, humid, and dusty environment. In addition to HART 5, the new ADMAG AXR supports HART 7, the latest HART protocol, eliminating the need for convertors to connect with HART-compliant control systems. HART 7 also supports and enables the automatic issuance of alarms when the device's settings are modified or a problem is detected by self-diagnostics. The electrode is one of the most important parts of a Magnetic flow meter. 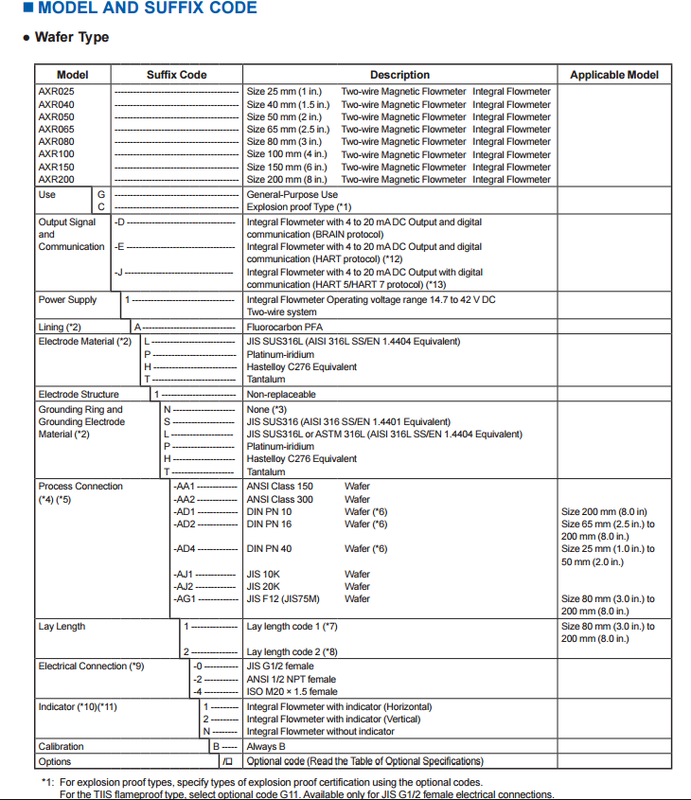 Only YOKOGAWA has "Adhesion Diagnostic Level Function". It diagnoses the condition of electrode surface and indicates the adhesion/coating in 4 levels. Users can change the detection level (threshold) depending on each individual process condition. This allows for predictive maintenance and reduced operating costs. YOKOGAWA employs Full-dot matrix LCD indicator. It can display up to 3 lines as required by the user and is available in multiple languages. Under the unit has an alarm, a clear message is displayed along with a solution. Specifications︰ The ADMAG AXR two-wire magnetic flow meter can be installed in the two-wire system without any AC power source, thus drastically reducing the initial instrumentation cost. 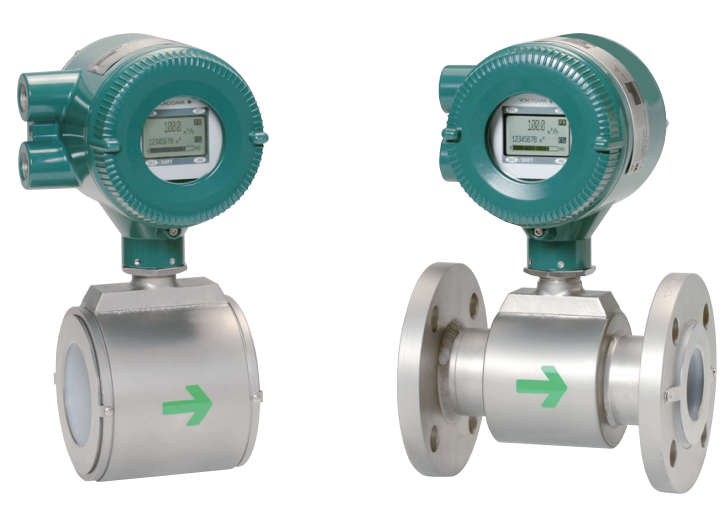 The ADMAG AXR is the world's first two-wire magnetic flow meter which employs the fluid noise free "Dual Frequency Excitation Method," achieving excellent stability for instrumentation. Like the AXF four-wire magnetic flow meter series, the ADMAG AXR has user-friendly functions such as a full dot-matrix LCD indicator, electrode adhesion level diagnosis function, and a multi-lingual display. The magnet switches can be used for checking and setting parameters without opening the case cover. Note: The "Dual Frequency Excitation Method" is a Yokogawa's innovation. Export Markets︰ Oil & Gas, Power, Chemical, Pulp & Paper, Mining & Metals, Water & Wastewater, Food & Beverage, Steel, Pharmaceutical & Cosmetics.